^ Diophantus, Father of Algebra Archived 2013年7月27日, at the Wayback Machine. ^ (Boyer 1991, "The Arabic Hegemony" p. 239) "Abu'l Wefa was a capable algebraist as well as a trigonometer. 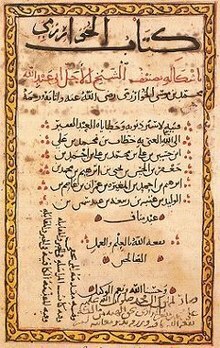 [...] His successor al-Karkhi evidently used this translation to become an Arabic disciple of Diophantus - but without Diophantine analysis! [...] In particular, to al-Karkhi is attributed the first numerical solution of equations of the form ax2n + bxn = c (only equations with positive roots were considered),"
^ "The Origins of Abstract Algebra". University of Hawaii Mathematics Department. ^ "The History of Algebra in the Nineteenth and Twentieth Centuries". Mathematical Sciences Research Institute. ^ "The Collected Mathematical Papers". Cambridge University Press.